ENOUGH is ENOUGH. How many times do we need to repeat this? 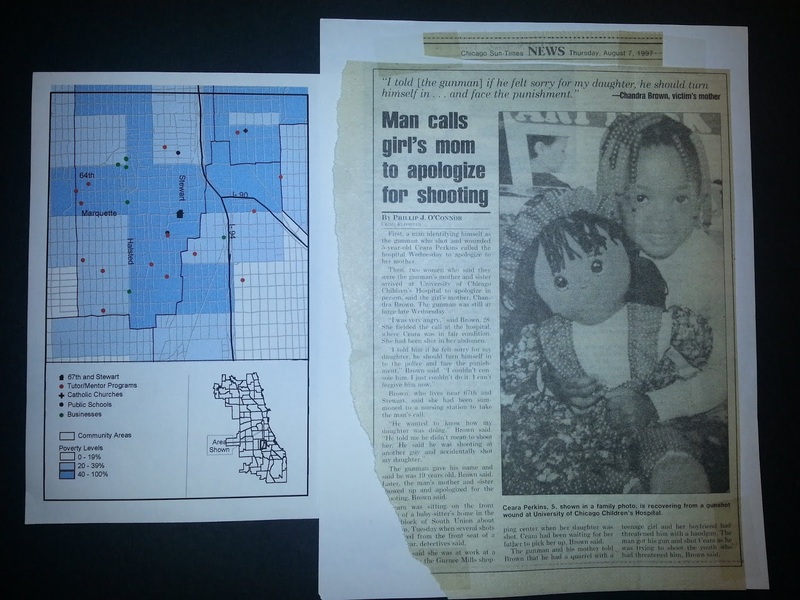 Today's SunTimes features another tragic shooting. We can't fix this problem over night but we'll never fix this until the media end stories of negative news by pointing to places where potential volunteers, philanthropists, business partners, faith leaders and others can learn more about the problem, and find places where they can get involved to help solve it. I wrote about this a few weeks ago after the last shooting. Please read this and encourage your friends and co-workers to get involved. Form a learning group at your church, company, civic group. As you learn more about the problem, your involvement will contribute more consistently to a solution. It's not up to the Mayor or Arne Duncan. It's up to each citizen to look in the mirror and say "If it is to be, it is up to me." I'm participating in another round of the Non-Profit Blog Exchange. These have been organized since November 2005. I've found them to be a valuable way to meet new people. For instance, I'm now sharing information in a Wiki hosted by the Pew Partnership for Civic Change. I was first introduced to by exchanging blogs with Suzanne Morse who writes the Smart Communities Blog. 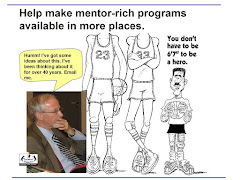 In May of 2007 I launched a Tutor/Mentor Blog Exchange and as a result, connected with Vermont Mentoring and Thierry Koehrlen and Clément Devaux at NosVies.com, who created a cartoon that I used at the Tutor/Mentor Leadership Conference. My goal of this networking is to bring together leaders from non profits, business, philanthropy, universities, churches, etc. who are already involved in volunteer-based tutoring/mentoring, and who understand the need to work together to solve some of the challenges facing this field. In this round of the Non Profit Blog Exchange, I'm exchanging blog reviews with Patricia Perkins who writes the World Touch blog. I must admit that when I first visited this blog I was a bit put off. The first article I read was a review of the World's Worst Web site. As I read it I was thinking about my own sites and how difficult it has been for me over the past 10 years to find volunteers and donors to provide the resources for me to operate the Tutor/Mentor Connection, and to share what I was learning effectively with others via the Internet. I'm sure a few people have told me how bad my web sites have been. I can also tell you that many people have told me they have spent hours on my web sites, and even created entire new tutor/mentor organizations based on the information they learned. One of the reasons I participate in Blog Exchanges, and other on-line forums, is that it is a form of recruiting people with the ideas and talent that can help me and others build more effective ways of communicating their messages to the public. Thus, my hope is that when we're critical we're also offering help. That's why I was pleased as I read further on this blog I found a list of Tools that technologists could use. This is helpful. I also learned that Patricia will be providing technology services for a new organization called West End Ministries. It will be interesting to watch how this organization communicates its mission and mobilizes resources using the technology talent that someone like Particia can supply. I hope that as this happens we're able to connect our missions because as I've learned in leading a small non profit for many years, it's not easy. You need many friends. Unless we work together to educate donors on the importance of our work, and the importance of a consistent flow of operating dollars, we'll all be competing with each other for customer attention and an inadequate pool of resources. I'll be visiting all of the blogs in this blog exchange, and I'm planning to organize another Tutor/Mentor Blog Exchange in August, with a focus on sharing ideas for recruiting volunteers. My goal is that this discussion builds public awareness and draws more volunteers directly to tutor/mentor programs in Chicago and other cities. If you'd like to participate, just introduce yourself here, or in the forums at http://www.tutormentorconnection.org . 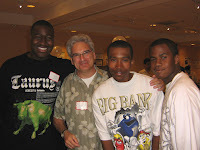 On June 8, 2007 the Cabrini Connections, Tutor/Mentor Connection celebrated its 15th year with its annual year end dinner. Above are three youth who have been part of this program for six years each, along with one of our volunteers, who has been a mentor for the past 4 years. While the newspapers are able to write stories about a few tutor/mentor programs, those of us who lead these programs need to find ways to tell our stories via blogs and web sites. We need to find ways that our volunteers, students and parents are evangelizing this work in their own personal, work and social networks. This has to lead to more consistent funding or even programs like Cabrini Connections won't be able to sustain these long-term connections with kids and volunteers. If you'd like to make a donation, or lend your time and talent to help tutor/mentor programs grow in all poverty areas of cities like Chicago, email tutormentor2@earthlink.net and introduce yourself. I'm not sure what has caused this, but the SunTimes and Tribune have been writing stories about tutor/mentor programs recently. I listed a few of these in a discussion I started in the T/MC forum. While these stories focus on single programs, I feel that Chicago and other cities need to talk about how to make programs like these available in more of the neighborhoods where they are needed, based on high poverty, poorly performing schools, or incidents of youth-on-youth violence. I think that there's another conversation that these stories can stimulate, which is a comparison of No Child Left Behind Supplemental Tutoring, and long-term tutoring/mentoring offered by programs such as those which have been featured in the media. If you view the links in the Chicago Programs Links section of the T/MC web site, you'll see additonal programs that offer comprehensive, mentor-rich services. You'll also see that there are very few of these comprehensive programs in the South part of Chicago, and in the South and West and North Suburbs. In reality, there are too few comprehensive, long-term programs in most high poverty areas of Chicago, and probably any other major city. That's why we need to stimulate a discussion in which teams of leaders from business, colleges, hospitals, churches, and civic and social organizations, are looking at the same information we're looking at, and doing the same type of brainstorming and innovation, with the same goal of making more and better tutor/mentor programs available to more kids who need this help. If you are part of such a team, I encourage you to use the resources at http://www.tutormentorconnection.org for your deliberations and invite leaders of tutor/mentor programs to be part of your team. The work we do in June and July can lead to more and better tutor/mentor programs reaching kids as school starts in September. In Thursday, June 7th's Chicago SunTimes, a few stories caught my attention. One was about a 29 year old man accused of killing a bank teller in a recent bank robbery. In describing the man's background the story said "he had a lot of time without parental oversight". Another story was headlined with "College Bound Sisters". This one was a good news story about how two sisters overcame obstacles and are headed for college. One of the reasons was they were supported by the Mike Trout and the Young Men's Educational Network. I've been clipping stories from the SunTimes and Chicago Tribune for several years to use as research and evidence showing why and where comprehensive, long-term, mentor-rich, tutor/mentor programs are needed in Chicago. 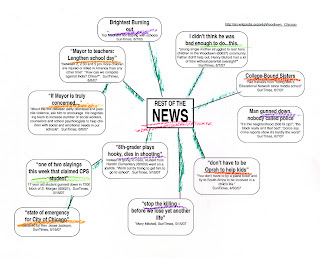 I occasionally map these stories creating concept diagrams like the one on this page. These show a linkage between media stories. However, this linkage is not supported by any obvious media strategy. Almost every day, one, or more, media stories highlight a serious social problem caused by poverty in Chicago (Rev. Jesse Jackson lables the recent string of shootings a "State of Emergency in Chicago"). Some of these reach a point of public outrage that they are followed by editorials, and/or a series of articles by featured columnist. While reports of bad news are given more space and featured more often, occasionally, the newspapers will tell stories of students overcoming the challenges of poverty, such as the story about two sisters graduating from high school. Out of a full page only the last few paragraphs showed the help these girls received for at least six consecutive years from the YMEN program. This is the type of program I have in mind when I say "long-term tutor/mentor program". However, there doesn't seem to be any consistent strategy from the media (or from public leaders) to connect the bad news stories, the good news stories and editorial commentary, in a daily effort to reduce poverty by mobilizing community resources. While media might highlight a single act of kindness, like YMEN, they don't use their maps and charts and web sites to point to all of the places in Chiago where there is poverty and poorly performing schools, and where programs like YMEN are needed to help kids avoid gangs and negative behaviors. Why is this important? Non profits who provide these services, don't have the advertising dollars needed to advertise their products and services every day like fast food or credit card companies do. Thus, they struggle to find donors who provide the flexible operating dollars needed every year to keep these programs available to kids in high poverty neighborhoods. Only business, media and faith institutions have the ability to communicate this message daily. We need some leaders to step forward to take this role consistently, like lawyers are doing at the Abraham Lincoln Marovitz Lend A Hand Program. If you use the Tutor/Mentor Program Locator to search the zip codes of neighborhoods where there is high poverty, or where the bad news took place, you'll see if there are any tutor/mentor programs like YMEN in those areas. 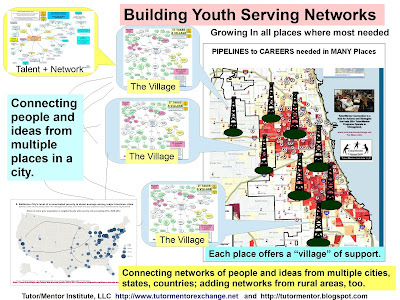 If you scan the program links section of the T/MC web site you can begin to discern the differences between programs like YMEN, Midtown, East Village Youth Program, Chicago Youth Programs, Inc, and Cabrini Connections and programs that exist in these areas. When you look at this information, we want you to say "ENOUGH." We hope you'll take the advise of another story I saw in a recent SunTimes. It said "You don't have to be Oprah to help kids." Tonight, June 8th, Cabrini Connections will celebrate its 15th anniversary year end dinner. In other parts of Chicago similar programs will be celebrating another year of tutoring/mentoring. Unfortunately too many neighborhoods don't have programs. I encourage our media, business leaders and candidates for public office to integrate this "REST Of The Story" message into their own strategies. Every time you talk about bad news, or the need for better schools, end your message by pointing to web sites with resources like the Program Locator and Chicago Program Links, so that your actions are helping people who want to end violence and poverty find places to shop and choose where, and how, they will use their time, talent and treasure to help tutor/mentor programs stay part of the lives of inner city kids in Chicago and other cities. The measure of a successful Tutor/Mentor Conference is how much people work together after the conference to help build more and better tutor/mentor programs in Chicago and other cities. Ellen Ingram, Director of Institutional Relations, University of Toledo (left in photo) and Anastasia Mirzoyants, MA, PhD candidate, (right in photo), were two of our speakers. They showed the planning process that they are leading from the University of Toledo which intends to support the growth of volunteer-based tutor/mentor programs in the city of Toledo. I'm the one in the middle. Anastasia and I began talking last November via the Internet, as she was doing research for their project. After several idea exchanges over a few months, the Tutor/Mentor Connection now is an active contributor to this planning. That's our goal. While we can help the University build more tutor/mentor programs in Toledo, we also want to help one or more universities set up leadership development programs that prepare students and alumni to be leaders of volunteer-based tutor/mentor programs in every city, including Chicago. In such training, we're aiming for alumni who will lead businesses and philanthropy, not just those who will operate tutor/mentor programs. The work we're doing with the University of Toledo is just one example of how we share the T/MC knowledge with others. We're also participating in a Learning to Finish wiki hosted by the Pew Partnership for Civic Change. In addition, we're mapping our strategy and sharing it on the T/MC web site. 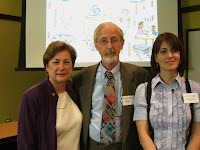 Our aim is to engage students, faculty and alumni of universities from all parts of the world, who each will take a role in creating a better support system for volunteer-based tutor/mentor programs, aimed at helping these programs have a greater impact on youth moving through school and into jobs and careers. In another wiki, you can see how we're reaching out to MBA students attending business schools throughout the country. If you join this discussion, you can help us engage more universities, businesses and others who need to be involved in helping recruit volunteers and donors this fall, as kids living in poverty are starting the 2007-08 school year. Now I don't want to pour cold water on such a gesture, but I want to point out how a few years ago we sent over 100,000 troops into war in Iraq and many of them did not have proper armor, proper training, and were led by leaders who had a poorly designed plan to fight this war. In 1997 I was a Chicago Delegate to President's Summit for America's Future, which was held in Philadelphia. Every living US President was represented and pledges were made to mobilize volunteers to help the 13 million US kids living in poverty. Not much has resulted because of the same lack of planning and support as we're seeing in Iraq. What will make this million volunteer mobilization any more effective than these other failed mobilizations? If we're going to mobilize volunteers to work in this war against poverty, we need to think of the infrastructure needed to make good tutor/mentor programs available in all of the high poverty neighborhoods where they are needed. We need to overcome the funding challenges facing non profits. It also means we need to learn to use maps, the way Generals use maps to distribute troops to all of the places where they are needed. We need to be able to point volunteers to specific zip codes, and to programs working with specific age groups, such as the Chicago Tutor/Mentor Program Locator is doing. This means we need to be mobilizing donors who will provide consistent, flexible and on-going operating dollars to agencies in those areas who are the connecting points between kids, volunteers and a wide range of learning experiences. This means we need to be setting up programs at universities to train people to lead such programs, who can work with youth and work with adult volunteers (who some times act like youth), as well as with donors and others who don't understand what it takes to motivate a youth and an adult volunteer to spend a few hours together each week, month after month, and year after year, so that the end result is that the youth is an adult who can take care of himself and his family, and has the skills and motivation to succeed in a 21st century Internet based world. I've written more about this on other pages of my blog and you can review a strategy that leaders might adoptby visiting the T/MC web site.